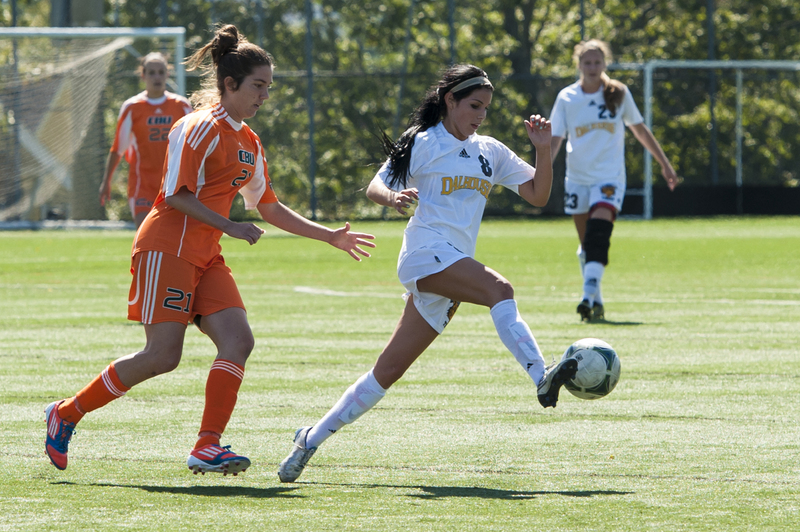 Defensive breakdowns and missed scoring chances resulted in a disappointing opening weekend for the Dalhousie women’s soccer team. On Saturday, the defending two-time Atlantic University Sport (AUS) champion Tigers fell behind against the high-powered Cape Breton Capers before battling back to secure a 4-4 draw. Problems surfaced six minutes in, as the Capers breezed untouched into the Tigers’ zone for the opening goal. The defensive lapses did not end there. After Dal drew even, Tigers goalkeeper Shannon Junor mishandled the ball off a corner kick, allowing the Canadian Interuniversity Sports (CIS) No. 9 Capers to capitalize. The second CBU goal led to a goalkeeping change for the Tigers, with rookie Rachel Hunt replacing Junor. “The first five minutes after your opponent scores is the hardest for them, because the team who got scored on fights back twice as hard,” says Dal striker Bianca Jakisa, who scored two goals in the first half on Saturday. The preseason CIS No. 5 Tigers proved resilient throughout the match, overcoming deficits of 3-2 and 4-3 to earn the single point. Momentum from their late rally did not carry over to Sunday’s match against Moncton. A fourth-minute goal from the Blue Eagles proved the difference in a 1-0 loss, as the Tigers’ offence failed to convert on its chances. It remains unclear who will be in the net for Dal when St. FX visits Wickwire on September 18, as both goalies delivered shaky performances. Hunt, who took over starting duties on Sunday, faced only one shot, conceding the early goal.